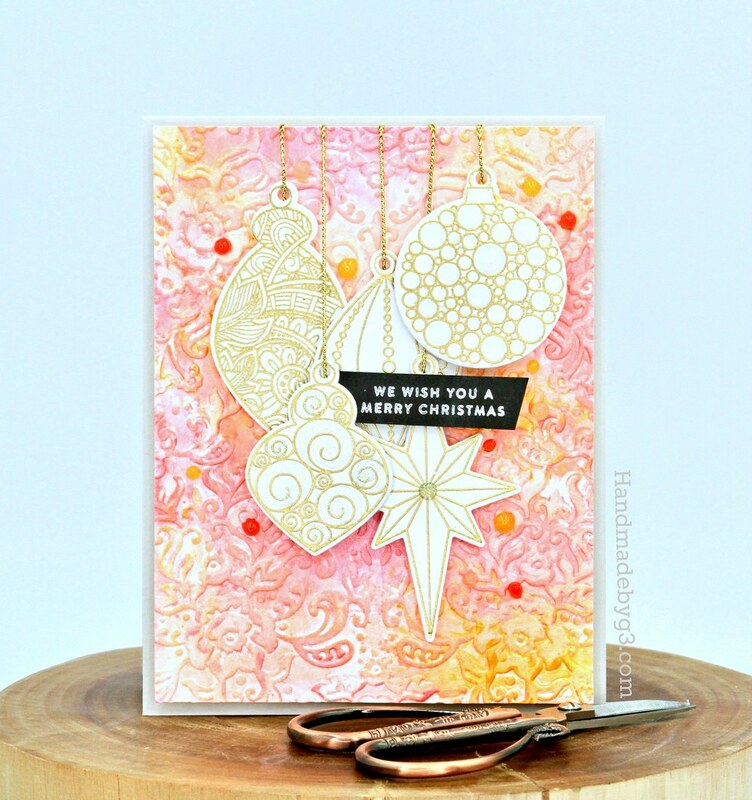 You all know Michelle Lupton if you are in the cardmaking community. She is a talented crafter and I am a big fan of her work. Check out her gorgeous work on her blog: Handmade By Michelle. So when Michelle messaged me asking If I could participate in her Challenge Me a Christmas Card series for 2018. Of course I said yes! Thank you very much for the invite, Michelle. I am honoured to be part of your series this year. Michelle challenged me to use the Faber Castell’s Gelatos. I have a box of Gelatos in my drawer somewhere for ages. I bought them when they were all in rage but could not for heaven sake work them out at that time. The Gelatos were not blending for me and I did not like the texture of it. So the gelatos sat in its box in the last drawer for years. So this was a real challenge for me. Michelle also said her Gelatos were forgotten. This was indeed a challenge for both of us. So when I pulled out the box and tested them out this time, they were great. I was able to dissolve them in water and by itself they were creamy. I really didn’t know what went wrong the first time. Anyway, I tried a few techniques and finally I decided to make two cards. One using Gelatos to make a background and the other for the focal point. 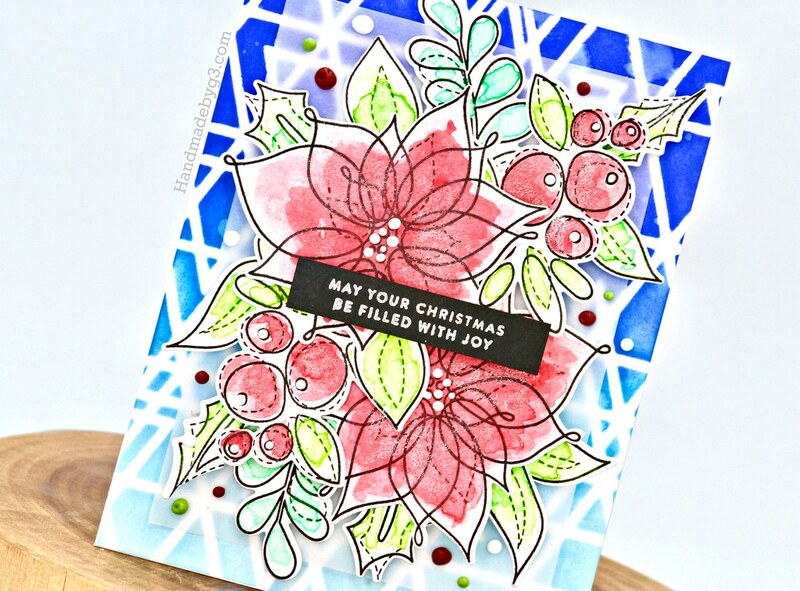 Card #1 – Using Gelatos to make background panel. On this card, I applied three colours of Gelatos directly on to an embossing folder, sprayed with water and ran a watercolour paper through it using an die cutting machine. The result is so pretty. The colours blended well and love the dark and lighter shaded of the colours on the raised edges and the dents respectively. The embossing folder is the Damask embossing folder from Taylored Expressions. There is also a shimmer to these colours. So in real life, they look shiny and pretty. I trimmed the panel to 4″x5.25″ in size. 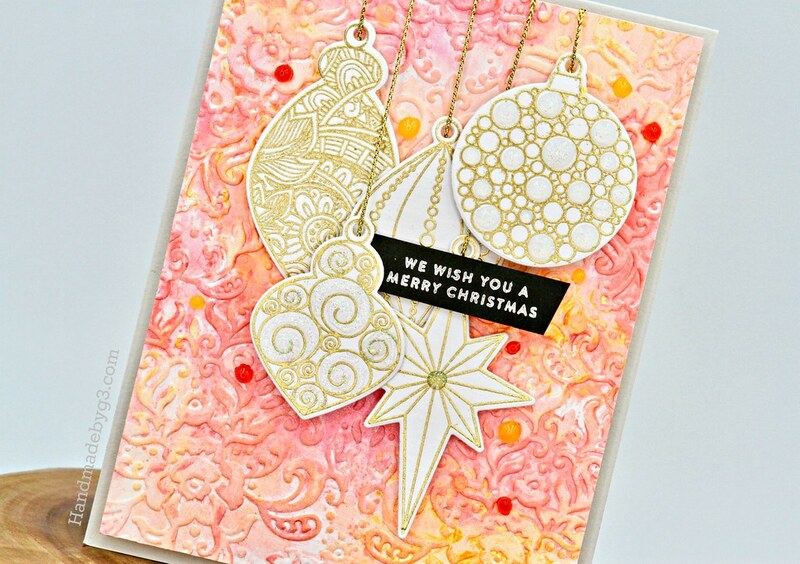 For the focal point, I gold heat embossed the ornaments from Simon’s Ornate Ornaments stamp set. Die cut them using the coordinating dies. 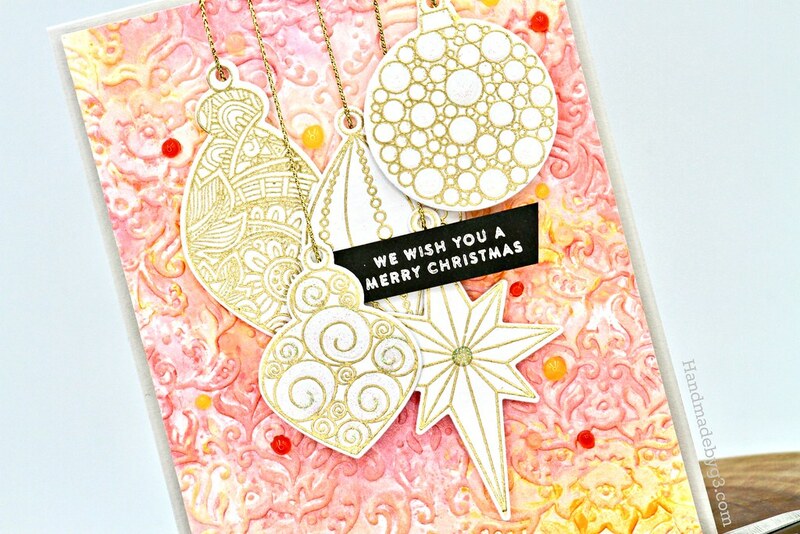 I added foam adhesive behind all the die cut ornaments and gold twine on top and adhered them in a cluster as shown. The sentiment is from Simon’s Tiny Words Christmas stamp set. I embossed the sentiment on a strip of black cardstock using white pearl embossing powder. For details, I added White Blizzard Nuvo crystal drops to some of the ornaments and some Nuvo jewel drops around the ornament cluster. Here are some closeups of the card. While making this card, I found the Gelatos dissolved well with water. So I decided to do just that and paint my focal images for card #2. For the focal point, I have used Simon’s Winter Flowers stamp set and coordinating dies. I stamped a few of the images on watercolour paper using versafine onyx black ink. Then used Gelatos to colour them. I used two of each shades to add layers and depth as much I could. Once dry, I die cut them using coordinating dies. I arranged and adhered them in a large cluster on a vellum panel. For details on the cluster, I added Nuvo drops in white on the berries and flower center. Nuvo Vintage drops in Pioneer Green and Postbox Red around the cluster. There is shimmer on Gelatos which adds to the details. 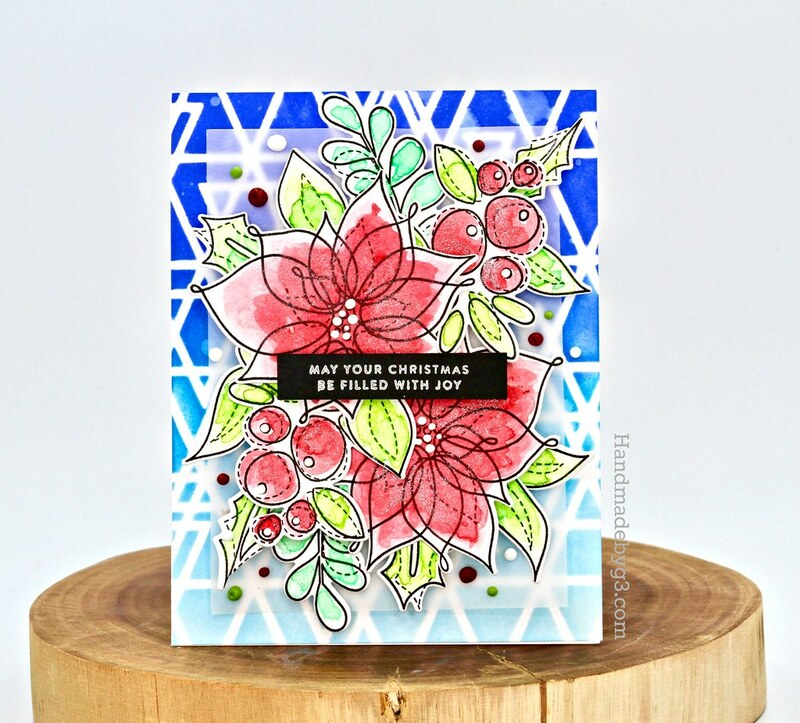 For the background, I used Simon’s Abstract Triangle stencil and sponged distress oxide inks in Blueprint Sketch, Mermaid Lagoon and Tumbled Glass. Then I added water to add texture to it. Once dry, I added the focal vellum panel on top using foam adhesives to finish the card. That’s it from me for today. 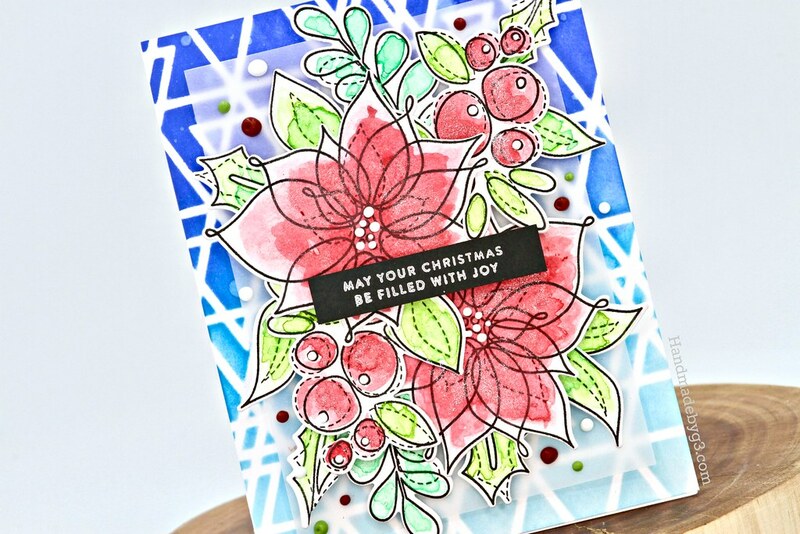 Check out Michelle’s blog for her take on using Gelatos to make a Christmas card. It was a pleasure playing along with you on Challenge me a Christmas Card, Michelle! I rediscovered Gelatos and I am so happy I did. I can start using them once again. Thank you for taking the time to visit my blog today.